The representation of space in the hippocampal formation has been studied extensively over the past four decades, culminating in the 2014 Nobel Prize in Physiology or Medicine. However, an important question remained unresolved: Is the role of this brain structure in spatial processing restricted to mammals, or can we find its origins in other classes of vertebrates? In this project we study two species of birds: Japanese quail and barn owl. While the quail is a ground-dwelling bird and an efficient forager, the barn owl is a nocturnal predator, tending to stand on high branches and scan the surrounding from afar, searching after distal visual and auditory cues. Techniques for recording from freely behaving animals are used to measure nerve cell activity of the birds foraging on the ground in 2D, or searching from afar, or flying in 3D space. A variety of avian behavioral tasks are devised in order to search for place cells, spatial-view cells and other types of space-coding cells. This entry was posted in featuredposts, Projects on 09/02/2017 by zyael. Animals actively scan the environment to collect useful bits of information. This pr ocess, known as visual search, is highly studied in humans and animals. What attracts the visual gaze and how barn owls search for interesting stimuli are the main questions asked in this project. We combine kinematic measurements of head movements with tracking of gaze point. Experiments are performed in spontaneously behaving owls as well as with trained owls performing a controlled visual task on a computer screen. To measure the kinematics we attach infra-red reflectors to the owl’s head and track their position using a Vicon system. To follow in real-time the point of gaze of the owl a wireless miniature video camera is mounted on the head. 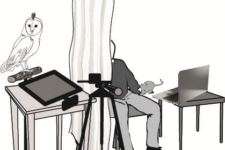 Using these techniques, on-going experiments address the following topics: combining visual and auditory information for saliency mapping, detection of camouflaged objects, pop-out perception and the role of active head motions in visual perception. 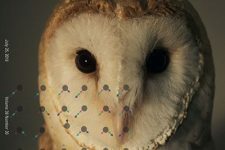 Results from the behavioral experiments are combined with results from physiological experiments conducted in our lab to gain an understanding of visual search mechanisms in barn owls. Lev-Ari Tidhar, Dutta Arkadeb, Gutfreund Yoram. Studying Visual Behavior in Barn Owls with a Miniature Head-Mounted Video Camera. The 36th Annual Meeting of the Israeli Society for Vision and Eye Research, Kfar Maccabiah, Ramat Gan, Israel, 9.3.2016. (pp. 75). Lev-Ari, Tidhar. and Gutfreund, Yoram (2018) Interactions between top-down and bottom-up attention in barn owls (Tyto alba) Anim Cogn 21: 197-205. The saliency of visual objects is based on the center to background contrast. Particularly objects differing in one feature from the background may be perceived as more salient. It is not clear to what extent this so called ‘‘pop-out’’ effect observed in humans and primates governs saliency perception in non-primates as well. In this study we searched for neural correlates of pop-out perception in neurons located in the optic tectum of the barn owl. We measured the responses of tectal neurons to stimuli appearing within the visual receptive field, embedded in a large array of additional stimuli (the background). Responses were compared between contrasting and uniform conditions. In a contrasting condition the center was different from the background while in the uniform condition it was identical to the background. We further randomly shuffled the position of the target in the array across trials, so that it occasionally appeared in the RF, as in freely viewing conditions where the owls actively scan their surroundings, to check whether such condition would lead to orientation contrast sensitivity. We were also interested in the effect of background homogeneity on response to the target. Different homogeneity levels were tested and responses were compared, searching after Gestalt-like perception of the stimulus, with the target popping-out over the whole background elements. Habituation is the most basic form of memory, yet very little is known about its underlying mechanisms. Given the assumed role of the gaze control system in stimulus selection (see section 2) and the direct link between habituation and stimulus selection, we assume that the gaze control system is involved in habituation. We therefore study the gaze control system of the barn owl with the aim to explore mechanisms of habituation. To this end we have developed a video based system to measure the pupil dilation responses and eye movements in barn owls. As previously shown, the pupil of the barn owl dilates in response to surprising auditory stimuli and readily habituates to repeating stimuli. Our initial analysis demonstrates a similar habituation to visual stimuli and shows that eye movements also habituate to repeating stimuli. These initial results provided us with an ability to use ocular parameters as a behavioral metric for habituation. To further characterize the habituation of the pupil response, we are currently studying effects of interactions between visual and auditory stimuli on the habituation process. S. Netser, S. Ohaion and Y. Gutfreund (2010) Multiple manifestations of microstimulation in the optic tectum: eye movements, pupil dilations and sensory priming. The Journal of Neurophysiology [Epub ahead of print]. The neural mechanisms that generate internal representations of the auditory space have been extensively studied, indicating the importance of precise integration, in time and space, of information from the two ears and from different frequency bands. However, the important question of how the specific neural connections are formed remained unsolved. Are these connections preprogrammed into the brain or are they formed selectively by acoustic experience? We have undertaken to explore this question in barn owls. For this purpose we raise young barn owls from the age of 10 days to the age of 60 days, in continuous broadband acoustic noise. In such an artificial acoustic environment the auditory signals which are typical of a natural environment are masked and, thus, the experience of localizable sounds is substantially reduced. We then carefully mapp the internal representation of auditory space in these and compared it with owls that were raised under normal conditions. Visual and auditory information is integrated in the brain to facilitate the perception of events that can be both seen and heard. The barn owl, with its excellent visual and auditory capabilities, provides an interesting case study for the mechanisms of visual auditory integration. Moreover, it was shown in barn owls that interactions between visual and auditory signals play an important role in auditory map plasticity. We focus on responses of multisensory neurons in the optic tectum, a mid-brain structure which contains aligned auditory and visual maps of space. Our findings corroborated results obtained in mammals, that responses to correlated visual and auditory stimuli are enhanced. But, we have also found that this enhancement was context dependent, being stronger in stimuli which appeared after a long period of silence, compared with stimuli that were embedded in a sequence of similar stimuli. In addition, we have shown that responses to correlated visual and auditory stimuli can be enhanced not only in the number of spikes but also in their ability to follow the temporal modulation of the stimulus (phase locking). In a second project, we studied the tectofugal pathway. Using a series of electrophysiological and pharmacological experiments we were able to show that this pathway carries auditory information from the optic tectum to the forebrain, in addition to visual information. Currently we are investigating visual auditory integration of motion information in the OT. For this we are employing virtual acoustic space techniques to simulate acoustic motion at various speeds and directions.